If You Aren't Going to Watch The Good Place Tonight, Why the Hell Not? NBC’s The Good Place premiered last year and immediately swanned off with all my good will. It’s a show that is riotously funny, with great characters and a completely unique setting. You absolutely should be watching it when its second season premieres tonight. The premise of the show is that Eleanor (Kristen Bell) dies and finds herself in “The Good Place,” a heaven equivalent that looks uncannily like a sunny, suburban neighborhood, designed by angel equivalent Michael (Ted Danson). Unfortunately, there’s been a mix-up and it turns out that Eleanor, who is a pretty terrible person, was sent to the Good Place by mistake—so she has to keep deceiving Michael and her good-hearted, properly assigned neighbors in order to stay there. Her designated afterlife soulmate is the philosophy professor Chidi (William Jackson Harper), who tries to teach Eleanor to be a better person. There’s also Jianyu/Jason, a Florida DJ who has been mistaken for a monk and whom Eleanor rapidly realizes is in the same position as herself. And then there’s Jianyu’s soulmate, and Eleanor’s new friend, the rich Tahani (Jameela Jamil), who spent her life raising money for charities while in the shadow of her more famous sister. In addition, one of the great things The Good Place did was start off as a show that seemed to be all about Eleanor, but evolved into a show where the other three Good Place inhabitants were just as important and developed as she was. In particular, Tahani’s backstory as someone who worked her whole life to raise money for charities—not because she truly wanted to help the world, but because she wanted to be better than her very perfect sister—not only revealed a lot about that character, but also asked a lot of questions about what “good” even means. The four of them became a unit, albeit a bit dysfunctional one. And even as we rooted for them, we also knew they weren’t technically good people. The show kept asking: how much did that matter? If Tahani actually helped people, do her reasons matter? If Eleanor was now committed to changing, did she deserve the Bad Place? How much “bad” would justify an eternity of suffering? And how much “good” would justify a perfect afterlife? The Good Place is a sitcom that is earnestly interested in exploring what “goodness” really means, and this elevates the show even beyond being simply well-acted, and full of rapid-fire wit and well-rounded characters. The Good Place can be enjoyed on so many levels: Just the visuals, just the word play, just the philosophy in-jokes, or just the character interaction. Any single aspect is a gem, but the whole show is a tiara. And on top of all that, then there was last season’s twist. That amazing, amazing twist. At the end of last season, it was revealed that all four of our beloved team members were actually in the Bad Place. Michael, in reality a demon equivalent, wanted to design a new kind of hell—more psychological torture, less eternal fire—where its inhabitants tormented each other. 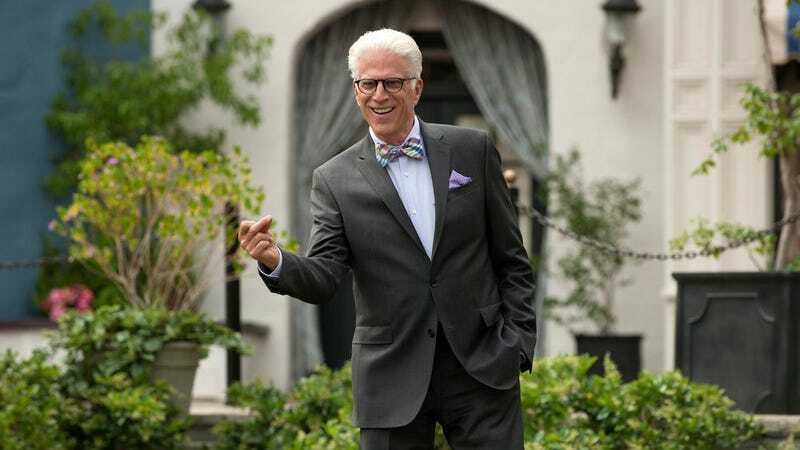 Ted Danson’s acting in the moment Eleanor figures out the Good Place is not Good at all was phenomenal; a slow, malevolent smile crossed his face and his wonderfully sinister laugh was unsettling as hell, selling the moment perfectly. Season two builds wonderfully off last season, with Michael rebooting the Bad Place and wiping the memories of all its inhabitants, in a second attempt to show his bosses that his unique vision of hell works. He’s split the four main characters up to prevent them from figuring out the truth about the Good Place again, but what he doesn’t know is that the previous Eleanor managed to smuggle her future, mind-wiped self a note—to find Chidi. So presumably season two will again be about Eleanor and the others finding each other and discovering the true nature of the Good Place, but now that we actually know these characters—and Michael’s real agenda—it’s almost going to be like watching a new show. It’s a show you should absolutely watch at 10:00 pm ET tonight on NBC. The only reasonable excuse not to is because you’re going to spend tonight binge-watching—or rewatching—season one. Either way, we can’t recommend enough that one way or another you spend tonight in the Good Place.